Conceive and develop a simulator able to evaluate the performance of the developed algorithms over tens to several hundreds of nodes in an ad-hoc tactical network. Develop algorithms defining the parameters and potential role(s) of each node in order to offer communication services for the user applications. Implement the best algorithm(s) on a PC controlling the ad-hoc network radio node for a real use in a field trial. The use of such algorithms makes a first step towards an automation of communication services, specified by the tactical applications. 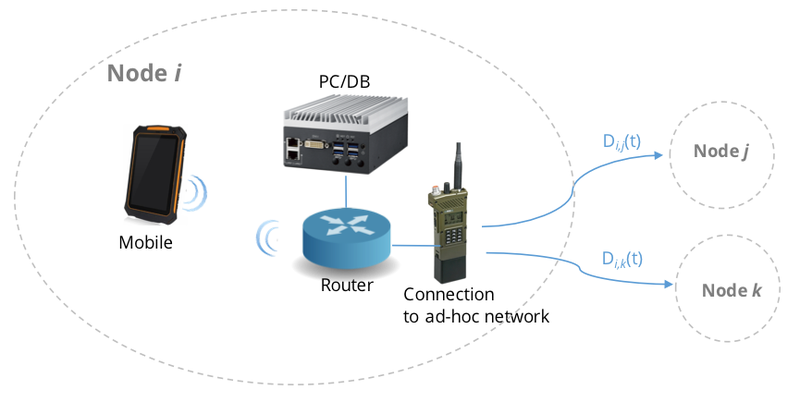 For example, one application is the deployment of data services for position tracking or for one-way messaging. Another application is maps (i.e., potentially large files) updates. Unlike nodes in conventional networks, each ad-hoc node to be considered here is capable of storing the data and/or specific critical information and to forward them where and when needed, typically when the best route becomes unavailable.